What a precious pair of Tummies!! 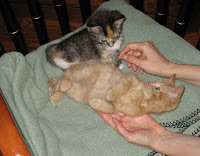 OMG - there is nothing better than kittens tummy! Oh, beebeez! 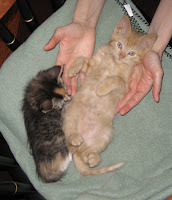 I love beebee kitten bellies! Perfect for noses! As a fellow foster parent, I applaud you taken in these two precious babies to give them a good start in life. What sweeties they are. I haven't had kittens in the house for a while and I miss the pitter patter of those little paws.